Our application for an independent judicial examination of the national temperature record now featured on WUWT. The tireless Anthony Watts reports our legal claim against NIWA (h/t to Andy). May it encourage climate realists around the world to make a similar study of their national temperature history. NOAA in Fear of Rush of International Lawsuits? “It is open to speculation whether NOAA may have been hesitant to admit to long standing faults for fear of a rash of lawsuits from its customers, mainly national governments and university research institutes. Based on such data most scientists agree that our planet may have warmed by 0.6 degrees Centigrade during the 20th century (with a margin of error of 0.5C degrees-but this error margin now looks way off). I’m convinced that ocean heat is a more appropriate metric (Oceans 70% of planet surface and major climate driver) and in this respect the Argo Buoy network is a fantastic resource but a good quality land record (Land 30%) should provide a complete picture. Unfortunately the quality and usefulness of global land temperature records has been so discredited that the only (until now) reliable recourse has been to satellite records. To loose this resource or for its reliability to be degraded as in the land records would be a travesty of the Trenberth kind. The usefulness of the AMSU-A (from previous comment) can be demonstrated if we wish to put some perspective on media snippets such as this from “Early warning for global disasters” by Robin McKie – Observer reproduced in the NZ Herald. “Recent events include a record-breaking heatwave that has seen Moscow blanketed with smog from burning peatlands, the splintering of a giant island of ice from the Greenland ice cap, and floods in Pakistan that have claimed the lives of at least 1600 people. Leaving aside the inability of the atmosphere to “trap” heat and that other scientists attribute the heatwaves and floods to jet-stream blocking events likely of solar cycle causation and dispute the ability of GHG’s to cause climate and weather change, what does AMSU-A tell us about today’s temperature in the lower atmosphere? These temperatures are taken in the late Northern Hemisphere (60:40 ocean/land ratio) summer. The same snapshot in 6 months time will be late Southern Hemisphere (80:20 ocean/land ration) summer. The entire ocean/land ratio is 70:30 so ocean (with the greater heat capacity) has the greater influence on long-term global temperatures. The land heat capacity is approx. a factor of 4.5 times less than ocean and the heat capacity of the atmosphere corresponds to only a 3.2m layer of the ocean. So although today Robin McKie has a slim case, the same might not be said in 6 months time given that the Pacific Ocean (PDO) has moved to a cool phase with the effect starting on the eastern side. South America and the western seaboard of USA has felt the cooling effect already in recent months with lethal consequences in some parts of South America. The thermal inertia of the ocean means that changes take place slowly but as the change is established, which will happen in the coming months, the effects will be felt dramatically from surrounding air (atmosphere) temperatures as has happened along the eastern American continent. Those AMSU-A temperatures will be worth watching on a regular basis. Matters arising from WUWT comments on this story. * In Fiji, access to WUWT is blocked by some ISP’s due to “threat” and “blacklist of the company”. NZ is a country where free access to information is taken for granted but there is suppression of dissenting views in the climate change debate. The NZCSC case will plot our course for the future in this respect – for better or worse. A quote from The Australian, Humans affect climate change article: “He said the fundamental principles of climatology, such as the role of carbon dioxide in global warming, were beyond dispute.” attributed to Dr Kurt Lambeck. * The varying levels of politicization in the NZ Court system and the bearing that will have on the outcome of the case. This case will give insight to local and international observers as to the state of NZ’s Court system in this respect. The US Supreme Court offered the same insight when it allowed the EPA’s CO2 is an endangerment to humans finding. 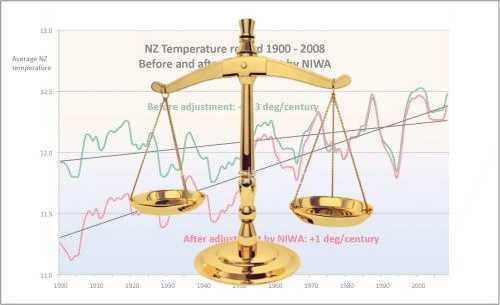 * The usefulness of NIWA’s NZ Temperature Record at local and global level. For the former, obviously the crux of the story but how representative and what of the outputs of the computer models using NIWA Temp Record input? For the latter, would not just two sites be adequate – central NI and central SI? * NIWA’s “adjustment” of the NZ Glacier Record and how to deal with it. It is desirable to have an objective discussion of global warming, and that could eventually occur in a courtroom. See how committed we are to “changing the climate” in the absence of debate! If we had one, it could change everything. However, for now it’s important simply to clear up the doubts around the NZ temperature record. Which of course does not require a discussion of the global climate. Many of our critics excoriate us for not “believing” in AGW and they transfer that scorn to anything we say or do. So unfortunately most of them remain unaware that we are asking questions of NIWA and their procedures – we’re not alleging their participation in some global conspiracy to invent global warming. Your comments about the likely insight into the objectivity or otherwise of NZ’s court system may or may not have some validity, but, being a party to the proceedings, I cannot comment. (2) the “Sea Surface” temperatures, which are averaged over the global ice-free oceans (60N to 60S), from the AMSR-E instrument on Aqua.